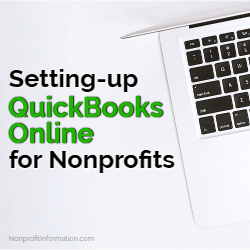 Many nonprofits utilize QuickBooks Online (QBO) for their accounting software – primarily due to its ease of use and ability to integrate with multiple applications. And, since nonprofits are required to employ fund accounting and many fund accounting systems can cost upwards of $10,000 or more, QuickBooks Online is an effective solution for budget-conscious nonprofits. However, because QBO is not inherently a fund accounting system, there are certain steps nonprofits should take to ensure their QBO account mimics that of a true fund accounting system. The first step nonprofits should take is to make sure they have turned-on all of the necessary settings in QBO in order for them to be able to track revenues and expenses by donor, by project, and by service activity. To do this, they should make sure the company type in the settings field is changed to “nonprofit organization”. This will change the QBO database so that the field “customers” is relabeled “donors”. In the company settings, they should also ensure that the Tax Form 990 is selected. Because the organization will want to track spending not just by donor but by project as well, it’s important to turn on the project feature in the account settings. The organization should also turn on classes, as this will allow the organization to track both revenues and expenses against the organization’s various services or activities. Once the organization has turned-on the appropriate features outlined above, they can then begin populating the system with their list of donors. The organization should enter all of their donors in the donor section that was created once the company type setting was changed above. QBO also allows the use of sub-donor fields, which can be useful if the organization is being funded by a donor with multiple agencies. For instance, if the organization receives funding from various agencies of the United Nations (UN), you would want to list United Nations as the donor and the various agencies that are funding the organization (i.e., UNDP, UNICF) as sub-donors. This will allow you to not only track funding from the various agencies, but to also see how much the UN as a whole provided the nonprofit. This information will prove useful when reporting to the Board, government bodies, and management, and for strategic planning purposes. The next step would be to enter all of the organization’s projects. If the set-up outlined above to track revenues and expenses by project was turned on, then you will now see a new module appear on your dashboard titled “Projects”. It is in this module that you would enter all of the projects and then assign them to each donor. You will want to be very careful when naming your projects, especially if the organization receives multiple grants from the same funder, to ensure you do not accidentally enter a transaction to the wrong project. Consider using a project number in addition to a project name to help prevent miscoding. Next, the organization should enter all of their services in the “Classes” list. Doing this means the organization will be able to track their revenues and expenses against the various services they offer. Nonprofits are required to report spending by program service area on their tax form 990, so having set-up the accounting system to track this information up-front, the organization can now easily extract these figures from the system. Knowing how much an organization spends on each of its various services is also helpful for reporting to potential funders, for benchmarking, and for gaining inside into unit costs (such as how much it costs to provide a social service to one recipient). The next step that the organization should undertake so that their QBO account mimics a fund accounting system is to set-up the three functional areas (program services, management and administrative, and fundraising) in the system. This will allow the organization to easily produce the required Statement of Functional Expenses. To do this, the best thing for the organization to do is to create three expense accounts: 1) Program Services; 2) Management & Administrative; and 3) Fundraising. Then, set-up the normal expense accounts (such as salaries, fringe benefits, travel, etc.) as subaccounts under each of those three parent accounts. This set-up will also help with allocating expenses across different functional areas. Now that the organization has set-up the system to track revenues and expenses by donor, project, service, and functional area, it’s imperative that all entries into QBO be tracked accordingly. You can turn on alerts in QBO so that any transaction missing a class produces a warning, but this can also cause some confusion because QBO will generate this warning whenever the class field is empty regardless if it’s a transaction assigned to an asset and liability account (in which case a class is not actually needed). The best way to handle this is to devise a coding system (using either numbers, letters, or a combination of the two) that matches the donor, project, class, and account set-up in QBO and to make sure staff are trained on the coding system. Allowing staff to understand the coding system and requiring them to code all bills and financial documents using the appropriate code(s) will attest to the organization’s internal control system by confirming that everything is reviewed before being entered into the accounting system. Once you have successfully set-up your QuickBooks Online account using these techniques, your nonprofit will be able to easily run reports that are already within the QBO system under the “Reports” tab. However, since the names of nonprofit financial statements differ from that of for-profit companies, you will want to adjust the header on the balance sheet and profit-and-loss statement to the correct nonprofit titles and save them as custom reports so that you can easily generate them again in the future without the need to manipulate the titles. It can take a little bit of time and effort, but setting up your nonprofit’s QBO is an important step to ensuring your organization is accurately practicing fund accounting. This will allow the nonprofit to not only properly report to the IRS how donated funds are spent but will also allow the organization’s funders and constituents, who, if they are able to properly see how their monies are being utilized and have confidence in the organization’s ability to properly manage and track their funds, may be more likely to continue donating to the organization in the future. Nonprofits needing assistance in setting-up or managing their QuickBooks Online account are welcome to contact Altiga Accounting & Financial Solutions at altigasolutions@gmail.com. Altiga can also provide you a step-by-step guide (with screenshots) for completing the steps outlined above. Altiga Solutions is a Gold Member of QuickBooks Online and the author of this article (James Willis) is a QuickBooks Certified ProAdivsor.